Tech O Blog : More about mini-Start in Windows 8.1 update 1 ! 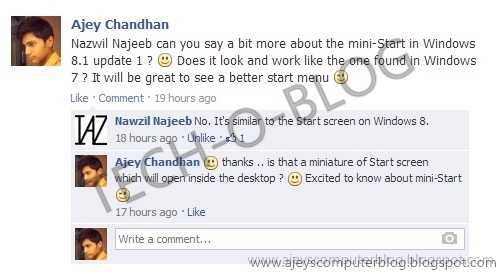 More about mini-Start in Windows 8.1 update 1 ! "mini-Start" has really heated the conversation about Windows 8.1 update 1 which may come with the new start menu will make it's way to users in April. If mini-Start comes to Windows 8.1 then,mini-Start won't look or work like the start menu found in Windows 7. So if you are expecting a full featured startmenu like the one in Windows 7,then you might be disappointed. He also added that mini-Start is similar to the Start screen on Windows 8. I think that Microsoft is building a Start screen which works inside the desktop, not by replacing it completely. I asked him the same but he has not yet commented . Whatever it looks like, it's going to work better with mouse and keyboard and importantly not hiding the desktop completely. "It's similar to the Start screen on Windows 8." I will update this post when Nawzil comments on the post. The mini-Start may or may not come with Windows 8.1 update 1 ! So take everything with a pinch of salt.